When I was in college, one of my professors (and he was no young buck) told us he lived his life in a series of five-year plans. It was his way of organizing what he was doing and where he was hoping to go. For some people, that sort of idea resonates. Personally, I'm not a fan, unless the plan is so loosely based that it is easily modifiable (e.g., "My five-year plan is to be alive in five years."). Five years ago, 14 players suited up for the Seattle SuperSonics. Ray Allen, Rashard Lewis, and Flip Murray were the three leading scorers (Murray's numbers came in Allen's extended injury absence) and the Sonics stumbled their way to a 37-45 record and a lottery appearance in the draft. Five years later, all but one (Luke Ridnour) of the 14 players are gone, the coaching staff has vanished, the front office is completely renovated, and the ownership is long gone. Somehow, I’m guessing this was not part of Howard Schultz’ master five-year plan. With that in mind, where do you see this Sonics’ team in five years? Obviously, barring nuclear holocaust, Kevin Durant will be on the roster. And it’s likely that he will be joined by Jeff Green. But who else? 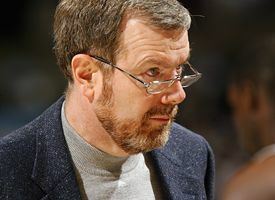 Will PJ Carlesimo still be donning that ridiculous long-sleeve tee with blazer combo that seems to have taken over the NBA? How about Nick Collison? Will Chris Wilcox still be tempting the Sonics’ beat writers with his “potential” five years from now? And Sam Presti, how much rope will he be given by Clay Bennett (assuming, of course, that Bennett is still the one providing the rope in the 2013-14 season)? Any other guesses? Wild speculation with ridiculous theories are always accepted. 5. Derrick Rose, Kevin Durant and to-be-named FA lead Sonics to second consecutive playoff appearance. Though he didn't actually suit up for the Sonics that year due to surgery on both shoulders, Collison was in the same draft as Ridnour (2 spots ahead of him). So, technically, 2 guys from that roster roster remain. Oklahoma City Thunderbirds. I like the sounds of that. Mo Sene named to his third All-Star team. If Nick Collison leaves I will boycott the Sonics no matter where they play. He is the heart of the team as far as I'm concerned. He always plays tough and bangs around like a madman. I have seen him take hits that would knock lesser players out. Nick deserves serious respect for never slacking. How can u call Collison the heart of this team. This team has no heart, no soul, no leadership, nothing. Nick is a quit guy who does his job and his job only. He's not the difference between winning and losing. He's a very good backup big man.